This little pup’s ears haven’t yet “stood up”. We’re sure in time that they will. 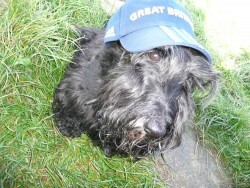 However, if your scottie is going through the same thing, why not check out what our Facebook supporters are suggesting. Our Mac’s right ear was about half-way up when he arrived. He was 5 months old. It took a few weeks, but one day there it was!